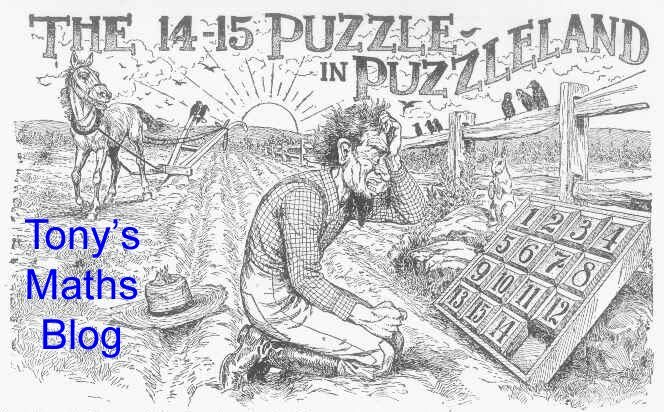 Tony's Maths Blog: Puzzles - to be solved, or to be admired? A blog about maths things which interest me. Puzzles - to be solved, or to be admired? The composer Howard Skempton once said to me that there are three kinds of piano music: music to be read, music to be played, and music to be listened to. I think something similar is true of mathematical puzzles. A mathematician buys a lottery ticket, choosing six different integers between 1 and 46. She (it's "he" in the book) chooses her numbers so that the sum of their base-ten logarithms is an integer. How many possible choices are there? I teach maths at a university in London.